IMPORTANT - Please note that this learning material may contain references to NDIS Client Funding records pre-v6.0, therefore some differences may be noticed. This resource is on our radar to be updated in due course. This article is designed to clarify the details about how the Transport line item - Assist-Travel/Transport (02_051_0108_1_1) transport is set-up and works in SupportAbility. Assist-Travel/Transport (02_051_0108_1_1) transport is set to an Annual unit of measure (UOM) in the NDIS Price Guide. It is also set to be a Quotable support item with no price. The annual UOM for Assist-Travel/Transport (02_051_0108_1_1) transport makes sense to determine the participant's budget for this support, however, in the real world of applying this and recording the transport included as part of the services delivered, it poses quite a challenge. For any support items set to Quotable in the Price Guide, the specific support item must be entered into the client's funding record with the Quote amount before it can be allocated to the activity. More information regarding this is outlined in the Customising NDIS Support Items article. However, the rules are somewhat different for this support item in SupportAbility. In an effort to make this easier to apply for providers, the default quotable rate for this transport line item has been amended in SupportAbility to the equivalent per kilometre rate of .78c. If we were to remove our default of .78c, OR if your organisation wishes to charge at a price different to .78c, then you will need to add the line item to the Client's Funding Plan and Customising the NDIS Support Item. After adding the item, you'll notice that in the Quantity field of the Support Item section in the client funding record, this displays kms, however, in the Quote field it states Each. This is due to no kms UOM being available in the Price Guide and it is actually charged in the quantity of each e.g. The Default Quote rate of .78c now populates in the 'Quote' field. If you wish to change this to another rate e.g. $1, simply update this value in the Quote field. A conversion tool is available when the Assist-Travel/Transport (02_051_0108_1_1) transport support item is added to the client's NDIS funding record to assist providers translating the total budget into kilometres. To use this, firstly ensure that the price per kilometre in the Quote field is the price your organisation wishes to use (the default is .78c). If for the services your organisation delivers, the kilometre rate of this support item changes and is not always the default of .78c, you have the ability to update this so that Staff [are] Allowed to Customise Rate e.g. 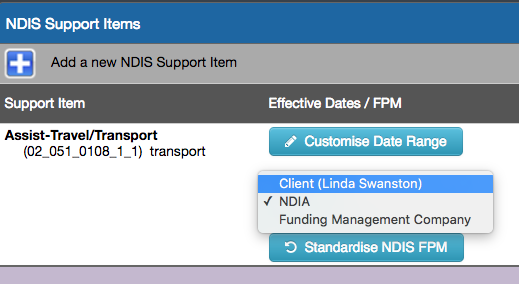 If this is selected, when allocating this support item within the activity, .78c (or whatever this has been set to in the Quote field) will populate as the the default price for this support item, however, staff with the View Financial Information staff account privilege will be able to customise the price as required within the NDIS allocation window of the activity e.g. To update the price select Customise Price and this allows you to edit the default quotable amount e.g. In most cases, this support item is set to being paid to the client directly on the NDIS support plan. If this is the case, the Financial Plan Manager for this specific line item can be set to the Client (or Client Billing Contact as set). 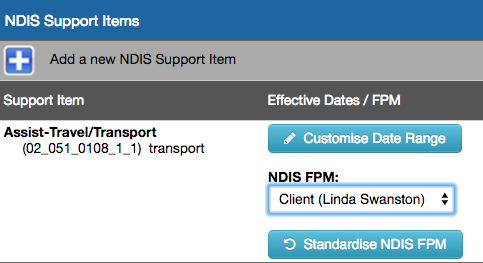 To do this, select the Customise NDIS FPM button within the support item e.g. Then select the Client, in this case the billing contact has been set to Linda, Tim's mother e.g. This means that whenever this support item is allocated within an activity, the invoice generated for the transport component of the service delivery (once the activity has been signed off) will be issued to the client's billing contact as they have been set as the Financial Plan Manager for this support item e.g. Please review the NDIS Funding and Allocating Support Items article for more information. Why aren't all NDIS Support Items available in SupportAbility?